This is an update on our developing understanding in a gecko's ability to stick to surfaces better than expected. It may result in better engineering of adhesive, but it certainly is teaching us how and what to fine tune. It also reminds us that even nature cannot produce a perfect solution. Otherwise a nice bit of ongoing research. Scientists already know that the tiny hairs on geckos' toe pads enable them to cling, like Velcro, to vertical surfaces. Now, University of Akron researchers are unfolding clues to the reptiles' gripping power in wet conditions in order to create a synthetic adhesive that sticks when moist or on wet surfaces. Place a single water droplet on the sole of a gecko toe, and the pad repels the water. The anti-wetting property helps explain how geckos maneuver in rainy tropical conditions. However, saturate that same toe pad in water or drench the surface on which it climbs, and adhesion slips away, the researchers say. As researcher Alyssa Stark, a doctoral candidate in UA's Integrated Bioscience Program and research team leader explains, geckos don't fall from trees during downpours in the tropics. What, then, makes them stick? The team hopes to make that discovery in order to create synthetic materials that hold their grip in wet environments, such as inside the body, for surgical procedures. Findings by Stark, Timothy Sullivan, who received his bachelor's degree in biology in May, and Peter Niewiarowski, UA professor of biology and integrated bioscience, are published in the August 9, 2012 issue of The Journal of Experimental Biology. "We're gathering many clues about how geckos interact with wet surfaces and this gives us ideas of how to design adhesives that work under water," says Ali Dhinojwala, UA department of polymer science chair and Morton professor of polymer science. "Nature gives us a certain set of rules that point us in the right direction. They help us understand limitations and how to manipulate materials." Stark and her research team members tested gecko toe hair adhesion in a series of scenarios: dry toe pads on dry, misted and wet surfaces and soaked toe pads on dry, misted and wet glass. The soaked toe pads demonstrated low to no adhesion proportionately with the wetness of the surface on which they were applied and pulled. Likewise, dry toe pads lost their adhesive grip increasingly with the amount of water applied to the surface upon which they were pulled. For the experiments, geckos were pulled on a glass surface by way of a small, gentle harness placed around their midsections. 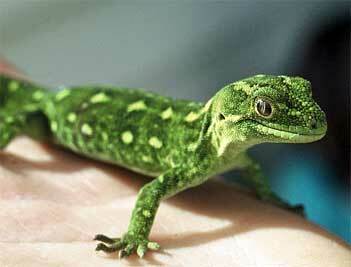 "There were anecdotes before the study that geckos can't stick to wet glass. We now know it is a bit more complicated than that. What we expect to learn is going to be relevant to synthetics and their capabilities to work not only on dry surfaces, but also wet and maybe, submerged ones," Niewiarowski says. "This implies a more versatile adhesive capability." After close study of the tiny hairs at the bottom of gecko feet that enable them to cling to surfaces, Dhinojwala and his colleagues have already developed a dry synthetic adhesive, composed of carbon nanotubes, that outperforms nature's variety. Now, with these new findings, Dhinojwala and his colleagues are one step closer to unfolding the secrets behind gecko toe adhesion in wetness. The researchers plan to further study the lizards in their natural habitats and in laboratory conditions that simulate them. They'll investigate grasping and release mechanisms, habits of the geckos in wet environments and other factors that enable the lizards to adhere to surfaces in wetness, such as to trees during rainfalls. "Our goal is to go back and look at what they're doing in nature and at what kind of surfaces they are walking or running on," says Stark, noting that UA researchers have already studied such behavior of geckos in Tahiti.